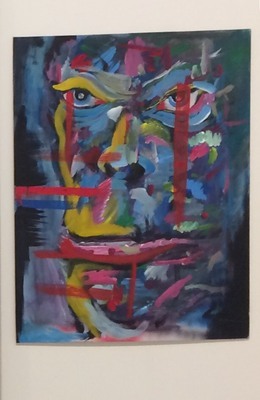 This pieces is part of a larger work entitled Faces. Into a face we could read? My work is an examination of the raw visual power contained within simple colors and forms, as well as the unescapable human familiarity of the face. Inspired by Cubist imagery, these works aim to push the viewer into not only creating, but also trusting their own initial interpretation of what their eyes may see. Through the medium of paint, I seek to create an engaging visual environment by combining color harmonies and surface textures contorted together into unrecognizable extremes. I believe at its purest form painting is a celebration of the very soul of color as an element, and it opens the gateway to a fantastic world beyond our own physical limitations. It is between the lines of reality when art is truly able to breathe in its glorious, unnatural eccentricity. When the door is open to create the impossible, why should we limit ourselves to reality? © Edward Joseph Atwell, 2018.